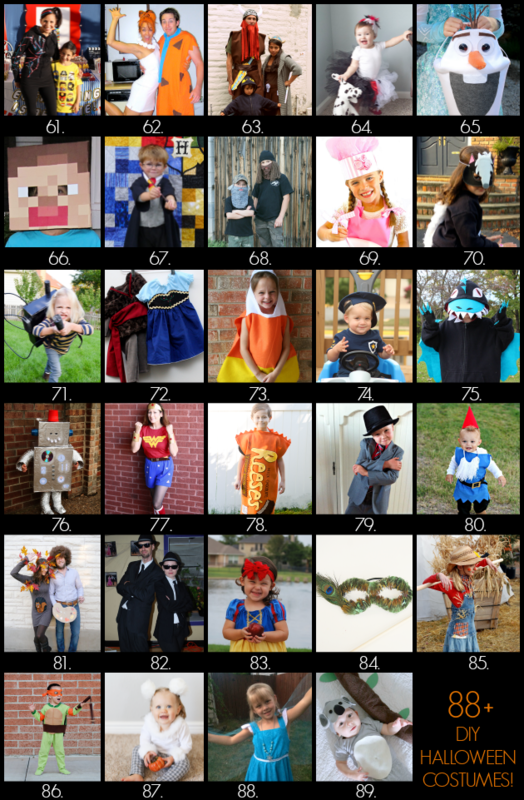 You are here: Home / Uncategorized / DIY Boy Garden Gnome Costume AND 80+ DIY Costume Ideas! Disclosure: This post for a DIY Boy Garden Gnome Costume includes affiliate links, this means I make a few cents if you buy the item after clicking my link. This costs you nothing, but it helps keep this blog running. Me and 80+ blog buddies got together to bring you 80+ DIY Halloween costumes including my little guy’s DIY Boy Garden Gnome Costume. I’m teaming up with Jamie Dorobek and her handmade Halloween costume site, Really Awesome Costumes to bring y’all tons of easy ideas to craft up DIY Halloween costumes for everyone including your pets, family costumes, and even a trunk or treat idea! Along with my Boy Garden Gnome Costume, I’m sharing 88+ more really awesome handmade costume ideas from talented bloggers everywhere! I am SO excited to give you a peek at what my little munchkin will be wearing this Halloween. I would have loved to make the tunic out of felt. I think it would have given it more of a woodland feel. BUT living in Southern California that’s just not going to happen, last Halloween it was well over 80 degrees. I say go for it if you live in a cooler climate! The only modification I’m going to make for Halloween night is that I’m going to actually attach the bead to the hat so it’ll stay on him better. Now come on, isn’t he the cutest little Garden Gnome you’ve ever seen?!? ***A big thank you to my mom who sewed this costume (I don’t sew, sewing makes me angry…am I alone in this?). My mom is awesome and helped me make this Owl Costume for my daughter a couple of years ago. Half of the fabric called for to make the Kid’s Scrubs costume. (This will vary depending upon what size your kiddo is). I used blue cotton fabric, but if your climate allows, go for blue felt. Party hat (mine was leftover from my little guy’s 1st birthday party, I got them at Target). White long-sleeved shirt (I chose a waffle shirt, I think it adds to the woodland look). I got mine from Target. Make the scrubs tunic as per to pattern directions, but exclude the sleeves and add a zigzag hem to the bottom. Unfold the party hat. Lay it flat and trace its outline onto the red felt. Cut out the felt and glue it to the party hat. Allow to dry, and then roll the hat back up. Glue the seams. Cut your white elastic or white ribbon to size (you want it to comfortably slip around your kiddo’s neck—I chose white elastic because I liked that it had a bit of a stretch to it). Tie pieces of yarn to your ribbon/elastic. Don’t worry too much about making the lengths uniform, you want them to be a bit random and not all exactly the same. *Hint, make your beard longer than you intend. This will leave room for you to trim the beard to make it look the way you want. Cut a belt buckle from a piece of sturdy cardboard. Paint it gold and alloy it to dry. Cut a piece of black ribbon to the size of your kiddo’s waist, adding an extra 3 inches. Glue the black ribbon to the underside of the cardboard belt buckle (on the back of the middle rung of the buckle). Allow to dry.